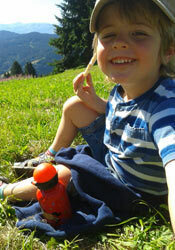 Les Gets in the summer is truly a place that can be enjoyed by the whole family. The slow pace of life makes the village a wonderfully relaxing place to be, whether you’re drinking a coffee in the shade of a parasol in one of the many street cafes, window shopping in the town or relaxing with an icecream by the lake. You may be looking for adventure, and basing yourself in Les Gets means you can explore the huge range of walking trails in the vicinity, go mountain biking, whitewater rafting, canoeing, try via ferrata or canyoning. 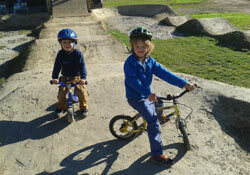 The boys love taking their bikes on the pump track. 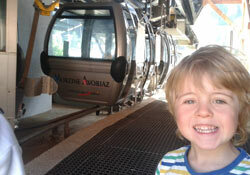 The bubble lift up Mt Chery – whether it’s riding the lift up and down (Samuel could literally do this happily for the entire day), having a picnic at the top, playing in the woods or biking all the way down to the village, we use the bubble lift pretty much every day! 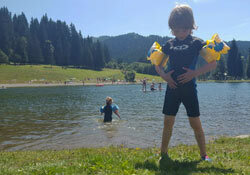 Les Gets lake, playground & volleyball court- the kids love swimming in the lake and for them, the volleyball court is just the biggest, best sandpit ever! 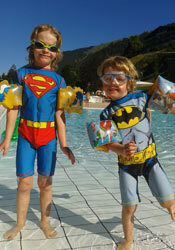 Morzine pool area – not just a pool, but several pools, a bouncy castle, and a playground in the shade near-by. 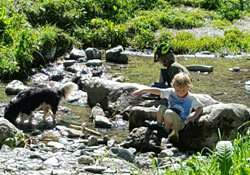 Many happy hours are spent damn building in the stream that runs through Les Gets. Petit Train excursions up to Mt Caly where you can stop for a picnic and get a lift back down, or walk to the top of the white bubble if you’re feeling energetic. 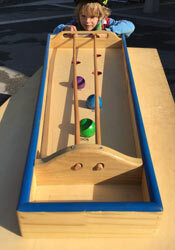 Wooden toys – every week the streets are closed and large wooden games line the streets for all to enjoy. 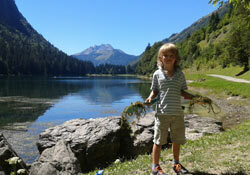 Montriond lake, with its new playground and beautiful, flat walk all around the lake. Phew! 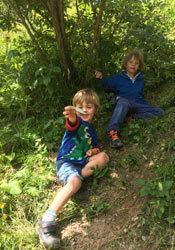 Time for a holiday, me thinks! !